The StFX O-Crew cheer a student from the incoming class of 2018 at Welcome Day 2018. As brand-new StFX students run through the tunnel of cheering, enthusiastic O-Crew members, it’s hard not to share in their excitement. It’s Welcome Day 2018, and almost 1,000 incoming students have descended on the StFX campus with their families in tow, ready to start one of the most incredible X-Periences of their lives. 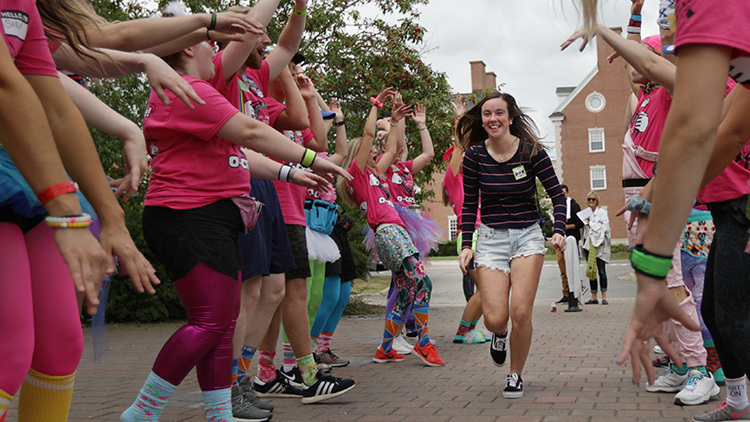 O-Crew – dressed in their trademark bright pink t-shirts – are providing the chants and the singing, but it’s clear the 2018 incoming class is already brimming with excitement as they check into residence, pick up their student IDs and settle in for a life-changing time. Countless returning students and many employees were on-hand to welcome all who have made the trip – from near and far – to StFX. As new students and their families entered the Charles V. Keating Centre, they were met by StFX President and Vice-Chancellor Dr. Kent MacDonald, who personally greeted all attendees. Excited students moved through registration and the Student Services Showcase, which featured information from departments across campus along with food stations and the always popular StFX photo booth. While students were meeting new friends and residence-mates, many parents attended information sessions on how families can help their student make the transition to university life. Dr. Kent MacDonald formally addressed new students and their families at the President’s Welcome ceremony held in the afternoon. “StFX is a selective institution,” he said. “Have a look around and recognize that you are among students from over 40 countries and from every province and territory in Canada. They, like you, could have chosen any institution and they, like you, chose StFX. He also addressed the emotion felt by many parents in the room as he recalled bringing his eldest son to StFX in 2008. “As a parent, this is exactly what we’re supposed to do. Prepare our children for this moment and set them free. This is a time of growth. It’s our job to prepare them to become adults. They’re going to fall down and stumble and maybe cut their knees. Dr. Kevin Wamsley, StFX Academic Vice-President and Provost, spoke to the strong academic standing of the incoming class, noting they had an entrance overage of over 85%. He also assured both students and parents that StFX’s strong complement of academic staff were there to help ensure both their scholarly and personal success. He also encouraged them to embrace new opportunities StFX. StFX Students’ Union President and fourth-year student Rebecca Mesay quoted poet Marianne Williamson in recalling that new students often feel great excitement, but also great fear. She then encouraged students to embrace their own courage. Andrew Beckett, Vice-President of Finance and Administration and Head of Student Services, reminded students of the wealth of supports that are available should they need them. “You’ll face good times and bad, triumphs and maybe a few disappointments. Don’t feel you need to face these alone. Welcome Day was a good start at StFX for Rachel O’Connell from Middle Stewiacke, who is entering the Bachelor of Science in Nursing program. “I was feeling nervous, but I got here and everyone is cheerful and everyone is talking to you. It makes you feel a lot more comfortable,” she said. The sentiment was echoed by Arman Gudelj, from Halifax, who is entering the Bachelor of Business Administration Program in StFX’s Gerald Schwartz School of Business. Arman was joined by his step-mom Kelly Valentine, who said she felt “confident” in his decision to attend StFX. First-year Earth Sciences student Karley Dixon from Pictou County said she’s excited to study something she’s really passionate about and is looking forward to meeting new friends. “Everyone has been super nice so far!” she said, as her dad James nodded in agreement. And although bringing your child to university is a bittersweet experience for many parents, Karley’s mom Lisa says she’s feeling good about the community that Karley has chosen.